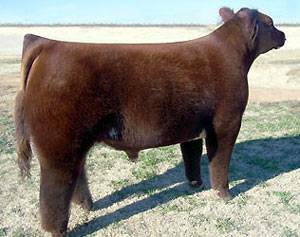 Read Headed Stepchild was the best calf in the southern Iowa sales of the spring of 2006. Topping the "Triple Threat" sale for Troy Hullinger. Red Head comes from a powerful simmi-maine donor cow that produced a steer that was 4th overall at the Indiana State Fair. He delivers tremendous bone, leg hair, and cleanliness of neck.